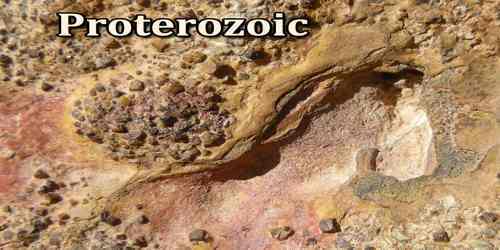 Proterozoic is the later of the two divisions of the Precambrian Eon, from about 2.5 billion to 540 million years ago. The Proterozoic was characterized by the formation of stable continents, the appearance of abundant bacteria and archaea, and the buildup of oxygen in the atmosphere. By about 1.8 billion years ago the oxygen buildup was significant enough to cause many types of bacteria to die out. 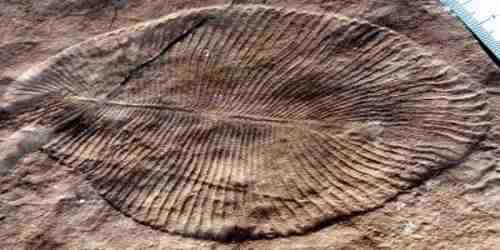 At this time eukaryotes, including multicellular algae and the first animals, first appear in the fossil record. It is subdivided into three geologic eras (from oldest to youngest): the Paleoproterozoic, Mesoproterozoic, and Neoproterozoic. The well-identified events of this eon were the transition to an oxygenated atmosphere during the Paleoproterozoic; several glaciations, which produced the hypothesized Snowball Earth during the Cryogenian Period in the late Neoproterozoic Era; and the Ediacaran Period (635 to 541 Ma) which is characterized by the evolution of abundant soft-bodied multicellular organisms and provides us with the first obvious fossil evidence of life on earth. 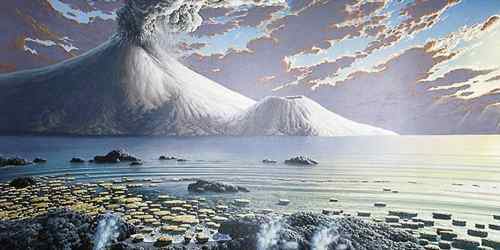 The geologic record of the Proterozoic Eon is more complete than that for the preceding Archean Eon. In contrast to the deep-water deposits of the Archean, the Proterozoic features many strata that were laid down in extensive shallow epicontinental seas; furthermore, many of those rocks are less metamorphosed than are Archean ones, and many are unaltered. The history of the Proterozoic Eon is dominated by the formation and breakup of supercontinents. By the time of the Archean-Proterozoic boundary about 2.5 billion years ago, many small cratons (stable interior portions of continents) dominated by island arcs had coalesced into one large landmass, or supercontinent. The breakup of this landmass is indicated by the intrusion of abundant transcontinental swarms of dolerite (a type of fine-grained igneous rock) dikes during the period of 2.4 billion to 2.2 billion years ago. These dikes resulted from the impingement of mantle plumes onto the base of the continental crust. This was the fundamental cause of the breakup of the initial supercontinent. During the period between 2.1 billion and 1.8 billion years ago, these fragments again coalesced, by collision tectonics, into a new supercontinent called Columbia. Many Phanerozoic basins contain thick piles of sediments and lie partly to completely on top of Proterozoic mountain belts, obscuring the underlying geological relationships. Some Phanerozoic mountain belts such as the Himalayas contain blocks of Proterozoic rocks many tens of kilometres in size that have been heavily reworked by later tectonic activity. Evidence of an increase in oxygen can be seen in the increase of red color in sedimentary rocks by the mineral hematite. Hematite contains iron, and just like any iron, it can rust if exposed to oxygen. Oxygen is a by-product of photosynthesis. Free oxygen in the atmosphere increased significantly as a result of biological activity during the Proterozoic. Around 2,000 million years ago, evidence shows that the amount of oxygen in the atmosphere increased. This increase can be attributed to oxygen produced from the photosynthesis by cyanobacteria and eukaryotes. The oxygen buildup was probably due to two factors: a filling of the chemical sinks, and an increase in carbon burial, which sequestered organic compounds that would have otherwise been oxidized by the atmosphere. Life during the Proterozoic began to evolve from simple single cell organisms into more advanced single cell organisms. Eukaryotes, single cell organisms with a nucleus and membrane, evolved from the more simple cyanobacteria. Evolution began to diversify the types of organisms found in the ocean around this time. This increase in abundance of life led to a major change in the atmosphere. During the Proterozoic, the earth had cooled considerably from the previous Hadean eon when the planet was covered by molten lava. 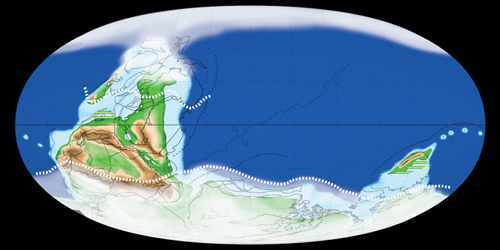 Near the end of the Proterozoic, ice sheets were growing towards the equator, and the entire planet was possibly engulfed under a thin layer of snow and ice. 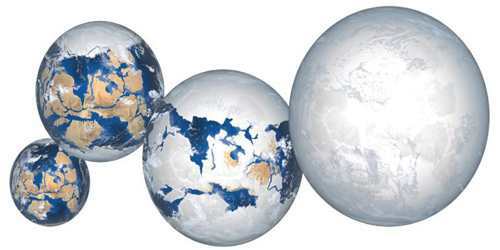 Although the cause of Snowball Earth is not understood, there is evidence that ice sheets were present near the equator around 650 million years ago.